Our Junior/ Intermediate segment is always busy and is a vital part of our club. We currently have around 20 Saturday morning players (Beginners and Advanced Beginners,) and 50 Junior Interclub players, making up 9 interclub teams ranging from 10 and under to 18 and under. We are very fortunate to have two coaches who have coached and played tennis around the world. Our head coach is Göran Gerdin. Göran coaches all our Junior Interclub teams and has a great deal of input on the direction of our young players. Robert Grundy is our Saturday morning coach, he teams up with Göran at 9.00 am and then takes the 10.00 am session. Robert and Göran have introduced Grasshopper Tennis to our club which has been a great success. Both our coaches, as well as having full-time employment and young families of their own, play interclub at a Premiere level . Kicks off at 9 am with Beginners. Our Coaches use both full size courts, and ‘Grasshoppper’ equipment which create a smaller court area to suit the size and ability of the younger children. At 10 am we have an Advanced Beginners session. These children are becoming quite proficient and use the full size courts and a variety of differing pressured balls. Interclub coaching happens during the week, Mon, Tues, Weds and Friday. Each of our 9 teams has an individual coaching session for one hour, as well as a second combined session (with several teams) which has an emphasis on playing games. We have some really fun events throughout the year aimed at our Junior players. 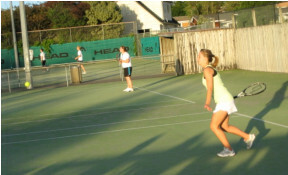 Because interclub is usually held on Saturdays, our club tournaments usually occur on Sundays, in the early afternoon. The Panaho Cup Tournament happens Feb/March and is a wonderful family event . To enter this doubles Tournament children (junior and intermediate players) simply need to be members, they can play with a family member or any adult (non- club members are fine!) Or they can enter playing with another Junior. Towards the end of summer we have our Junior /Intermed. Club Champs this tournament has singles, doubles and mixed doubles. And is great way to finish the season! No season would be complete however, without a Junior/ Intermed. Prizegiving these are usually held on a Sunday afternoon when the interclub season is complete, around the beginning of Term 2.